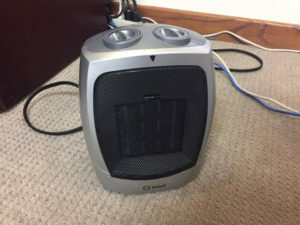 When temperatures fall, office workers bring out the portable space heaters to keep warm. As an employer, you should make employees aware that that portable electric space heaters can present a “major workplace safety hazard,” according to Electrical Safety Foundation International. “Fires can be caused by space heaters without adequate safety features, space heaters placed near combustibles or space heaters that are improperly plugged in,” ESFI says. If an employer doesn’t have a policy banning these devices, it’s important that they establish safe guidelines for their use. Require employees to obtain approval from a supervisor or facility manager. Ensure the device is certified by an independent testing laboratory. Position the heater at least 3 feet away from flammable materials such as papers, clothing and rugs. Keep heaters out of high-traffic areas, such as doorways, where they can be a tripping hazard. Don’t use extension cords or power strips, as these can overheat and start a fire. Instead, plug the device directly into a wall outlet. Refrain from plugging additional devices into the same outlet as the space heater.